"You're a gutsy daredevil with a give 'em hell attitude and a fourth grade education. You coulda made sergeant." 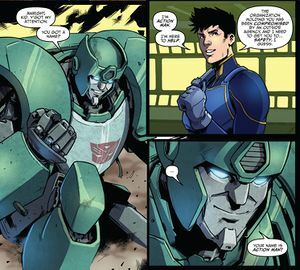 An Autobot who was old even before he took the slow route back from the beginning of another universe, Kup is an ornery old codger and follower of Optimus Prime. Since the Revolution incident, he's taken to adventuring with his young human pal, Action Man, who has yet to get tired of his stories. There were plans for Kup to appear in M.A.S.K. : Mobile Armored Strike Kommand following Revolution. However, M.A.S.K. writer Brandon Easton ultimately decided against using him, leading John Barber to pick him up for Revolutionaries.